Essential Cleansing Balm: The perfect cleansing balm for all skin types, but particularly for sensitive skin due to how calming and nourishing the ingredients are. Rosehip oil, rose geranium oil, bisabolol and coconut oil are among the ingredients that combine to heal, nourish and soothe the skin. A small amount of this massaged into the eyes and face and it melts away every scrap of makeup, even stubborn liquid liner and mascara. It's a real treat to massage into the skin as it feels so nourishing yet it rinses easily to leave the skin feeling thoroughly cleansed, soft and smooth. It's one of the most inoffensive yet effective cleansers that I have used. £27.50. Essential Hydration Concentrate: Described as a 'hug in a bottle' this is a multi-purpose product - it can be massaged into clean skin or added to moisturiser both morning and night, which is particularly beneficial over the cold Autumn/Winter months. This product is comprised of nine plant oils that combine to create a rich, indulgent, nourishing oil that leaves the skin feeling supple, hydrated, plump and looking bright yet calm. Only 1/2 drops are needed per use because of how powerfully moisturising it is and my favourite way to use it is to warm it between my palms and then take the time to massage it into my skin but I will be adding a drop to my morning moisturiser when winter arrives. £29.99. Liquid Gold 24 Hour Moisture Cream: Speaking of moisturisers, for morning use, their Essential Hydration Balm is one that I have repurchased several times but haven't included it in the photo above as I don't have one at the moment. This is the perfect moisturiser for sensitive skin as it contains a combination of fatty acids and sea minerals, which hydrate and soothe the skin without feeling heavy or clogging pores. I also find it particularly useful if my skin is going through a period of inflammation. For night-time use, I love their Liquid Gold 24 Hour Moisture Cream, as it contains glycolic and lactic acids, which renew and brighten the skin and hyaluronic acid to hydrate the skin. When I use this moisturiser, my skin always looks plump, bright, glowing and healthy yet it doesn't tingle in the way that some glycolic acid products can. It's ideal for sensitive skin because it has all of the exfoliating properties of Liquid Gold but it doesn't leave the skin looking red or feeling dry because it's delivered with moisturising properties. It doesn't feel heavy on the skin - in fact, it's quite lightweight but does pack a punch in terms of moisture. With regular use, skin is smooth, soft and bright with refined pores and improved texture. £51. Liquid Gold: Acids can be scary when you have sensitive skin but if you want bright, refined, smooth skin, they are necessary. Liquid Gold is an easy way to introduce glycolic acid to your routine - a few drops on a cotton wool pad (a dampened pad initially if you are completely new to acids) swiped over the face and neck at night will reveal bright and smooth skin. Over time, you can build up to using it up to 3 times weekly and I recommend applying a moisturiser afterwards if you have dry or sensitive skin as it will still be effective but less intense than applying Liquid Gold alone. I recently finished my second bottle of Liquid Rose Gold, which I personally prefer as I find it more hydrating than the original and I don't always feel the need to follow it with a moisturiser. I have a comparison post on the two Liquid Gold products here if you want to decide which one might work best for you. £33.50. 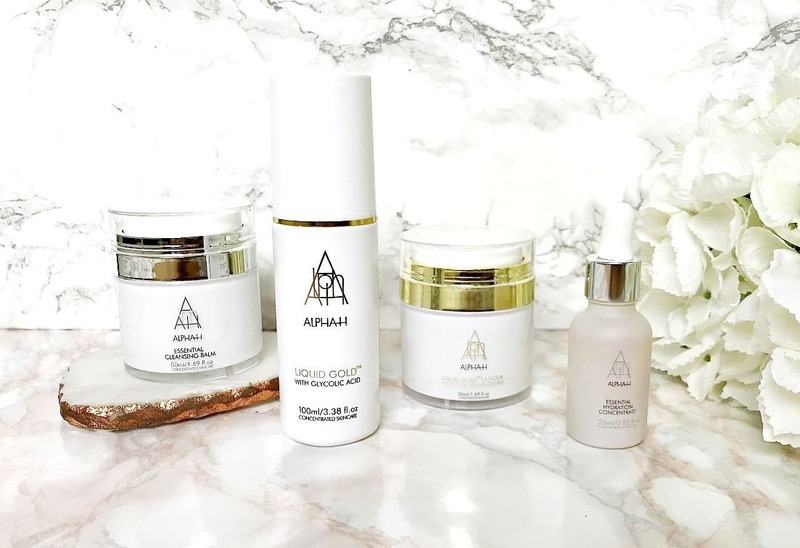 If you are new to Alpha-H or have shied away from trying the brand due to having sensitive skin, I hope that you will have found this post helpful. Like I said earlier, I have easily reactive skin and I can use all of these products without any problems and have repurchased most of them several times over the past few years. All of the products are very effective and results can be seen overnight with the acid products. With consistent use, skin texture is much improved and pores are refined - I especially notice that the little bumps that can sometimes appear under the skin along the jawline or on the forehead, disappear with regular use of the Liquid Gold products. Don't forget that there is free worldwide shipping on all Alpha-H products on Cult Beauty for the month of October! Have you tried Alpha-H? What's your favourite product? I would love to hear! All products are bought by me, unless otherwise stated. Some of these products were kindly sent to me but were previously purchased by me. Opinion is always my own. Affiliate links may be used.